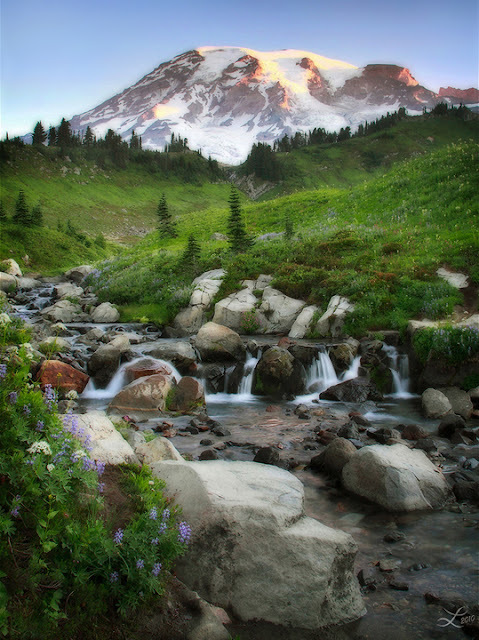 Rosy morning sunlight dances over beautiful Mount Rainier with Edith Creek and purple lupine wildflowers in the foreground. Copyright Laura A Knauth, All rights reserved. Please contact me for any usage or licensing options. I played around with some Orton Diffusion to evoke a more peaceful morning effect. I'm a huge fan of digital RAW mode after this. The golden morning light surprised me, and I was so rushed to whip out the right filters and setup the shot that I ended up accidentally taking this with -2 EB from a previous experiment. Doh! The glancing light on the peak was done by the time I noticed what happened, but I was able to salvage the photo by adding back the +2EB in DPP. Whew! Posted by Laura A Knauth at Wednesday, May 29, 2013 No comments so far. Comments Welcome! My second favorite photography post-processing technique (following Midtone Contrast using Unsharp Mask) is Orton-style diffusion. I have been using this for the past couple years to varying degrees in just about every image starting with Morning at Mount Rainier. The Orton effect adds an almost mystical, dreamy element to the atmosphere which you can dial up or down depending on your preference. When I first learned about the general idea of the Orton technique, I was using it globally on whole image, but I've come to apply it now by default only to a small degree just the shadow areas (since shadows in real life appear to the eye just a bit more blurry than bright areas). The camera usually just makes shadow areas more noisy which can degrade the overall impression of the image, even if it's not immediately noticeable. So even if I'm not looking for a noticeable Orton effect, whether it's just for gently blurring the shadows or taking the edge off sharpening artifacts, I love Orton diffusion! This blends back even more of the original sharpness. (This assumes all of the intermediate Orton-related layers are still de-selected. I use all of these steps to create an Orton-style diffusion so often, all of those steps now seem totally straightforward. As with anything, it gets easier with practice (especially if you are liking the results). 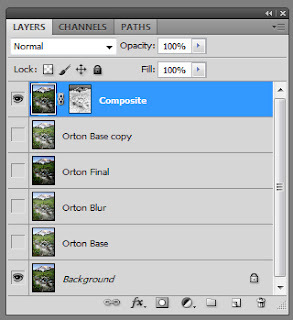 At a minimum, you can also try just blurring a duplicate layer, setting the layer mode to Multiply, and then tinkering with the Opacity % for a simple, basic Orton effect. However, I find the complete steps listed above preserve the overall light/dark impression of the image which I usually find valuable. I recorded a macro once I got familiar with the proceedure and particular settings I liked (which really helps to speed up the future process). Figuring out how to give your image an impression of sharpness without looking overdone (especially for the web) is challenging. Using an Orton diffusion effect in the shadows for the final sharpened image has been giving me just the right backoff I've been looking for. It can also be helpful for giving images a dreamy, painterly atmosphere that I find absolutely beautiful. Hope you find these tips helpful! Incorporating unexpected elements of the landscape can add unexpected delights! 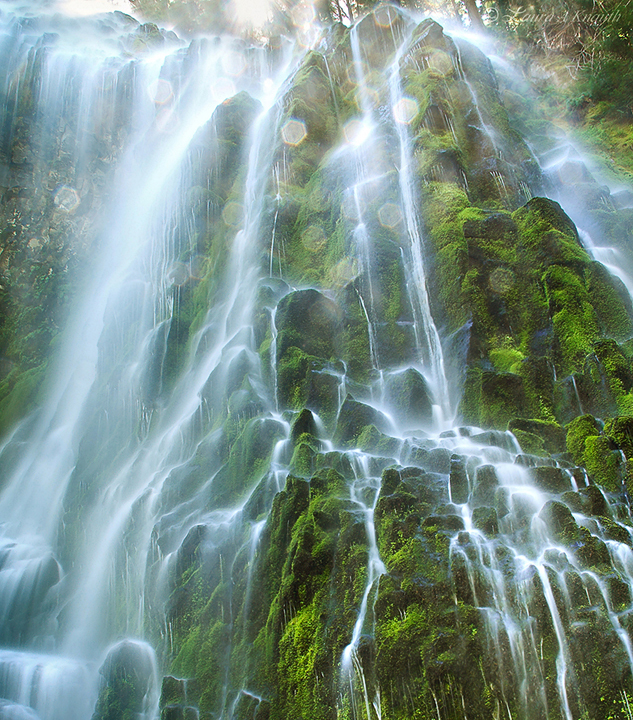 Proxy Falls has so many different cascades; the volume of sound from this place was amazing! I remember being drenched standing anywhere near the main blast, but off on the sides the spray wasn't quite so aggressive.This particular location was particularly enchanting since you could be fairly close and still look up at the water as it was pouring over the rocks and mingling with the sun. Posted by Laura A Knauth at Tuesday, May 28, 2013 No comments so far. Comments Welcome! I've found that using dedicated luminosity or color layers in Photoshop has been a very helpful technique. It provides more control for your intention by eliminating unintentional artifacts. Actually LAB mode has native capabilities that essentially do the same thing (since L is a separate lightness channel, and 'a', and 'b' are the color channels). I've been using the RGB mode primarily though (so far), and for this color mode (RGB: red, green, blue), both the lightness and color information is mixed together, so adjustments intended only to effect light or dark values, might tweak the colors as well. These artifacts might be subtle, but over several adjustment layers, I found myself noticing the impression of my image to be increasingly 'off' from what I was expecting. Being very specific about whether the adjustment layer is intended for the light/dark (luminosity) or color and setting the Photoshop layer modes accordingly has helped me to create adjustments that function as I originally intended. Sometimes, I like when the 'Multiply' layer mode adds some color saturation as it darkens, but sometimes I don't (which is when I would use this Luminosity clipping technique). If you want to use photoshop layer modes like Multiply (darkening) or Screen (lightening), you can also 'mask' these effects with the luminosity mode by adding a new 'dummy' adjustment layer (I usually use levels) and "clip" the light-related adjustment adjustment layers to it. (alt/option+click the line separating layers to clip the top layer to the bottom) Then set the dummy layer mode to 'luminosity', and any layer clipped to it (you can stack them) will be restricted to luminosity-related changes only. So, that's the basic idea. I've been finding it very helpful in all my recent processing, and hope you find it useful too! Posted by Laura A Knauth at Monday, May 27, 2013 No comments so far. Comments Welcome! The Astoria Bridge towers over the remnants of an old dock one foggy morning. This was one of the first images where I started paying close attention to dedicated luminosity and color layers when post-processing in Photoshop. I find this technique very useful for reducing unexpected artifacts and allowed for more control. More details are available in the article. at which point they promptly beat him and tossed him outside. Why bother measuring what can be measured when you could just have a contest about who has a bigger ego? Sigh. Take a look at most news 'shows' today and you will likely see glaring evidence of the same bad behavior as the author of this parable was warning about hundreds of years ago. Life is complicated enough without distractions from the cult of personality. While you might expect salesman types (or news personalities) to be most susceptible to personality-driven, ego-based arguments instead of fact-driven focus, I'd caution for the same vigilance even for the most esteemed in the academic community as well. Most modern academic inquiries seem to be based on skepticism - that is, putting proposed ideas to a rigorous test, then either: finding any crack or failure which would invalidate the idea, or else having found no failure, giving the idea an official stamp of approval. A valiant attempt. But unfortunately, I think this approach ends up discarding too many good ideas, too many true facts, along the way. If a champion of an idea makes a mistake in their presentation, the ultimate idea may still be right even if the implementation by that particular champion is flawed. How many times have you seen a news clip, video, or read a quote from a random person in the news who's main idea you agreed with, but cringed at their bad choice of words. It's a case where you know the underlying idea is better then how it sounds. All too often you see the result: bad presentations create easy 'straw men' that are easily dismissed or ridiculed. The lesser argument can appear to 'win.' 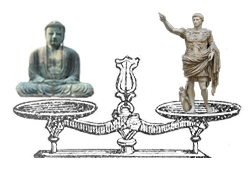 In this way, skepticism can lead to these same personality-based arguments overshadowing truth-based inquiries. The danger is when such criticism deters others from ever looking at that badly framed idea again. It creates a blind side where potentially real truths are left unknown, unmeasured. But what if everyone took on that responsibility for themselves? While it is definitely valuable to understand the best currently accepted theory from the experts, I would caution very strongly from stopping an inquiry there. Now if this latest default position happens to meet your needs, then you're done. But if you are still dissatisfied with limited options, I don't think it's reasonable to despair, thinking the official line is the only reasonable course of action. I think it's reasonable to hear other possible options, regardless of the source. I love this approach; it can be so invigorating and inspiring. The key is to look for shreds of truth, not seek cracks of failure. With this approach, you are not an unsuspecting childlike consumer that must be fed only sanitized options, you are autonomous investigator, looking for glimmers of hope in a motley universe. For example: rather than reading only approved textbooks or talking only to an approved authorities, you could read fringe books, listen to podcasts, or watch YouTube videos just to find one useful phrase or idea (although hopefully you can prioritize so the odds are better). And you will definitely have to activate your best pattern matching mind filter (serious discrimination skills needed) because there will likely be a lot of misguided tangents to sift through. But for all that, you may find that just one phrase becomes like a key, unlocking a whole new viable approach. That one idea could be life changing, opening up huge opportunities or cost savings. The very approach you stumble upon from random fellow human beings might become lauded by experts in the next 50 years, but has just not been officially recognized yet. It's a common blindside in our society. How often do you hear: "No one could have seen it coming." … Really? How about taking a look at the people who were thrown out of the tavern, so to speak. Going back to the parable, if too many useful facts are being ignored due to the tendencies ingrained in modern society, I think one good option is to figure out how to make the best use of that true information. Could be a business opportunity, or just something simple you can incorporate to benefit your own life. Anyway, good ideas are usually just a fraction of the total energy compared to what it takes to convince someone else the idea is right. Why bother with that anyway? Such arguments really do seem mainly ego driven. Posted by Laura A Knauth at Sunday, May 26, 2013 No comments so far. Comments Welcome! At the time I took this photo, I didn't know about the six stop ND filter (which I now use for most water-related shots), but the naturally low lighting just after sunset naturally allowed for a surface blur across the water and helped reveal long colorful reflections. (I hadn't expected the blurred boats near the dock (they were barely moving to my eyes), but love that it adds a subtle impression of movement in the scene. This was actualy one of my first shots with my Canon 50d camera, and seeing it reminded me of a particular quirk I had to learn about the camera at the time in order to get this shot. In order to leave the shutter open beyond 30 seconds (the limit of my camera in Aperture or Shutter priority modes), I set the camera shutter time to 'bulb' and use a cable release to manually hold the shutter open. I had to play around with the exposure to find an aperture/time combination that worked well. But on Canon cameras, just switching the camera 'on' isn't sufficient to enable the 'bulb' shutter setting. There's an additional tick on the power dial which is a required setting before the camera can be set to bulb shutter mode. Posted by Laura A Knauth at Thursday, May 23, 2013 No comments so far. Comments Welcome! but some are more efficient than others. 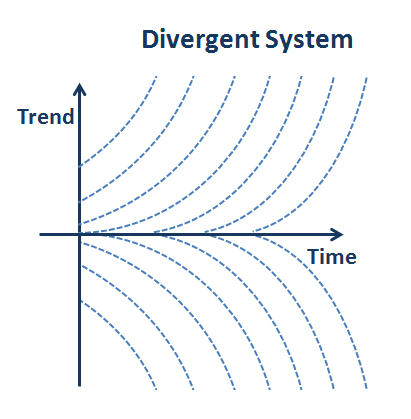 I am attempting to show the trend of two systems over time. 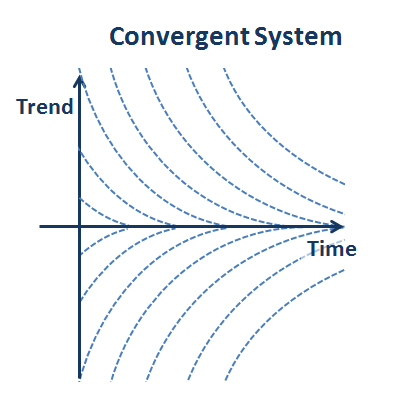 In my example, the ideal functioning of the system is in the center, along the Time (or horizontal) axis. In the day to day functioning of the system, noise or external events can bump a data point away from ideal. As time continues to increase, the datapoint, the result of the system, would follow one of the trendlines shown. 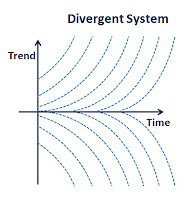 Once the ideal functioning of a divergent system is perturbed, the trend of that system will follow the trend lines of the divergent chart, leading ever away from ideal. 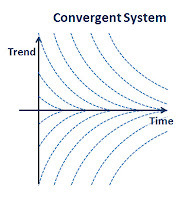 If a point on the convergent system is perturbed from it's ideal, over time, the convergent system will trend back toward ideal, re-establishing the balance point with minimal external effort required. 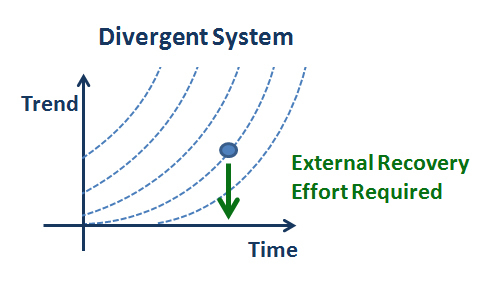 There is a useful 'path to victory' in both systems (along the Time axis), but divergent systems are high maintenance, while convergent systems are self-correcting. Divergent systems require authoritarian oversight and constant micromanaging to make sure they continue to function properly; and there is a constant danger of over-correction. 'Fishtaling' is a constant threat when correcting divergent systems since what was supposed to be a correction can instead cause the system to spiral out of control in the opposite direction. Only tiny deviations can set off a chain reaction that can cause a response that moves far away from ideal. 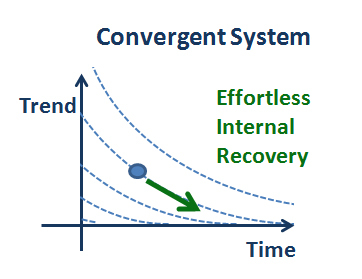 But once you setup a convergent system, further maintenance is minimal. 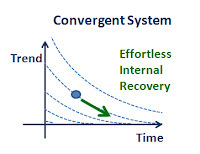 The convergent system 'fights' external inputs that seek to push it off course. Sounds like a good idea to me! For some real world examples: you could think of driving your car in reverse as a divergent system. It can be done in a pinch, but extreme care must be taken with every course correction to ensure the car does not veer wildly out of control. A much more stable system is driving your car forward. Once you set your course, physics supports holding the car in that line. You could say fission (used by modern day nuclear reactors) is a divergent system, but fusion (a process of the Sun) is a convergent system. Constant energy must be expended to prevent fission reactions from running amok and causing destruction in a cascade runaway. With fusion, energy must be expended to maintain the reaction; if the energy input stops, the reaction ceases. Automatic fail safe. When I go on walks or am doing chores, I think it's a useful thought exercise to wonder about the various factors or issues effecting my day to day life and try to see whether they fit into more of a self-correcting (convergent) system, or whether they are more destructive (divergent) systems. Last year, I realized the very functioning of our bodies might be tied to this concept. I began to consider whether we are born with convergent, self correcting bodies, analogous to a convergent system. It's common to see references of children's remarkable ability to heal quickly, and equal jabs about the opposite effect as we age. Is that really natural? What if over time, our bodies become compromised as a result of mistaken advice or otherwise improper maintenance and in essence, move gradually from a Self Correcting system to a Self Destructive system? It suspect most modern medical approaches follow a divergent, self destructive view the body. It suggests that our bodies are prone to failure and requires constant, expensive, interventions to maintain health. This intervention often leads to side-effects, which are accepted as normal collateral damage. (Now in cases of acute trauma, I am all for emergency intervention, but most health costs and most dire statistics are from the chronic conditions.) What if our time and energy, our effort and our dollars are instead be spent not not on constant interventions, but on re-establishing our natural self correcting mechanisms? Modern medicine does not often emphasize this as an option, but since reducing medical costs and increasing longevity are some of the most sought after solutions in our modern life, I think this approach worth a test. My Health blog posts cover more specifics about my latest health strategies. 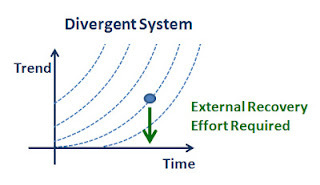 It's also useful to consider how the different divergent and convergent systems fit into financial strategies. Instead of accumulating increasing monthly debt bills and then trying to win the lottery (divergent system), a better strategy might be to setup a more convergent system such as: to reduce or eliminate fixed expenses and set up systems of income (passive income, for instance). I would certainly love a windfall anytime, but for planning purposes, striving to setup systems of income seems a far more stable and long term lucrative approach than hunting for single treasures. There are many surprising and 'hidden in plain sight' examples of divergent systems through varied aspects of modern life. Just wanted to share some ideas to hopefully inspire creativity towards more efficient long-term solutions. I'd say trying to hold the ideal line in a divergent, or self destructive system should be a final resort in an emergency, or as temporary stop gap. But on a day to day basis, instead of spending energy chasing after 'fires' and worrying about micromanaging the individual effects of random noise or unexpected external events, whenever possible, I find much larger financial, energy, and time wins by recognizing opportunities to support or create self sustaining systems. Posted by Laura A Knauth at Wednesday, May 22, 2013 No comments so far. Comments Welcome! These are springtime flowers on a sunny day from one of my favorite perspectives: the wide angle close up. Contrary to most flower shots, I didn't zoom in, but set the widest angle possible and moved the camera as close to the subject as it could stay in focus. This was a spontaneous photo moment. I didn't have any fancy gear with me and just was heading back to my car when the lovely flowers in the median caught my eye. I remembered I had a little point & shoot camera with me, and it was nice to find a creative way to reflect on the moment. The camera is essentially touching the ground with the lens pointed back up at the flowers. Needless to say, I had to spam many many shots through trial and error since I couldn't look through the viewfinder, but it was a lot of fun! I wanted to highlight that I overrode the camera settings to force the flash to fire. This is a helpful technique for shooting subjects in the midday sun where the normal camera settings can have a tendency to expose for the background leaving the subject in the dark. The remedy is to force the flash to fire; it acts as fill flash, allowing the subject to shine. :) It probably looked strange to passersby seeing me use the flash in the daytime, but this shot wouldn't have happened without it! Posted by Laura A Knauth at Tuesday, May 21, 2013 No comments so far. Comments Welcome! Whenever a new idea comes on the scene, in order for it to be adopted as the new standard, it has to not only be inherently better on paper, but also has to overcome the tremendous inertia of the existing infrastructure. It's good to keep this in mind, because when working on your own new ideas, it can be frustrating to realize that a more efficient solution to common problems might exist, but everyone seems to be ignoring it. Instead of spending energy complaining about why these 'brilliant' ideas are not adopted, it can be useful to figure out the practical reasons why the existing systems prevail. There is a cost to manifesting new ideas in an existing environment. Unless someone's really good at marketing, it seems to me only incrementally good ideas will fall by the wayside, and only ideas that improve the status quo by at least an order of magnitude (ie: a paradigm shift) have a chance to gain traction. When taking on the responsibility of manifesting new ideas (as an entrepreneur), unexpected, but practical problems, might actually provide crucial insight as to why the current paradigm does exist. That experience can at least provide valuable insight about the true complexity of the problem. Not to say the existing paradigms are the final solution, but at least realizing the true complexities of a problem removes artificial frustrations about why what appears to be the obvious solution is not adopted. Blindsides happen when focus is too limited and you are still buffeted by unseen effects from the full system. At least making the effort to solve the problems you see would (at worse) reveal more factors to take into consideration. You can then rework the problem from this new perspective, or you might decide what you thought was a problem, is actually a decent solution. So it seems a big win either way to put your energy where your mouth is, so to speak. By investing energy in your own ideas, you either learn more about crucial variables you had overlooked, or you are successful at providing a helpful solution to a tough problem! Posted by Laura A Knauth at Sunday, May 19, 2013 No comments so far. Comments Welcome! I have to say I really love this image even though it is simple. Typifies the cloudy days that are still beautiful in the Pacific Northwest. 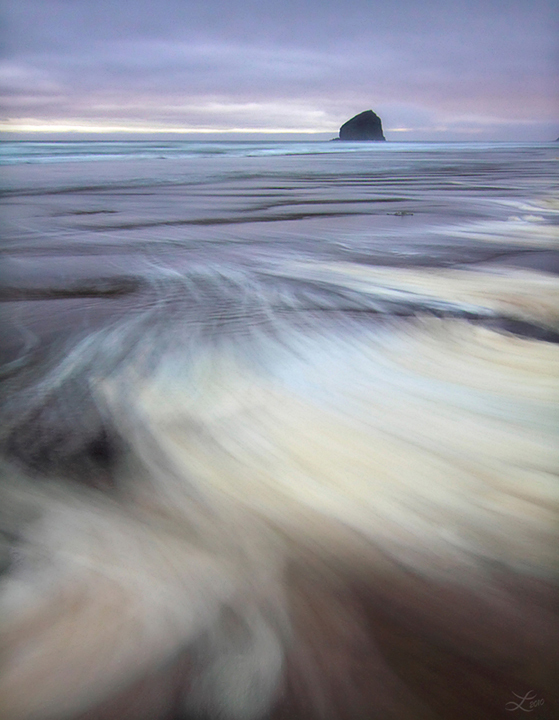 This is haystack rock near Cannon Beach, Oregon. A processing technique I've recently found and will start incorporating in all my future images is to add a final tweak to boost the brightest whites of the photo. Seems to really make the image sparkle. I started re-opening a copy of the image in Camera Raw and bumping up the Highlights slider in the Tone Curve tab slightly to the right (starting with +10 or so). I also check whether bumping down the 'Dark' slider slightly to the left adds an appealing effect. Sometimes that can really add richness to the tones. I've been watching what these sliders do to the tone curve in Camera Raw and have started mimicking that recently in Photoshop directly using a final Curves adjustment layer. Doing this step too soon in post-processing might take away more detail then you intended, so I've been saving these final adjustments to the end. Just wanted to mention this technique because I've realized that just when I thought my images were essentially finished, I found I liked the image much more after trying these final highlight or dark tone tweaks. Posted by Laura A Knauth at Friday, May 17, 2013 No comments so far. Comments Welcome! Inspiration is akin to picking out your destination on a map. Capability is operating the vehicle that takes you there. Without inspiration, you might drive around aimlessly in circles or endlessly haul someone else around to fulfill their wishes. Without capability, you stay put and dream of lovely places never to be physically seen. Staying 'in the zone' of balanced inspiration + capability requires constant vigilance (and especially requires taking responsibility for yourself ... before something else does). Keep trying to optimize through experimentation, notice the results, and iterate ever onward! As you continue along your path, you might decide shift your intended goal, or upgrade your transportation along the way, so to speak. As children, we start out with grand inspiration, but lack experience, the capabilities to achieve those visions. I think it is a crucial life challenge to develop capabilities without loosing sight of our own initial inspiration. I think we are susceptible, especially in the modern environment, for our capabilities to be honed in service of someone else's goals, not our own. A very dangerous blind side. After finishing so many years of earnest training, we might become like little assassins - our capabilities serving to manifest the intentions of another. That may sound dramatic, but it's so easy to become sidetracked. It's a straight up difficult process to 'become who you are'. Talk about a moving target! In some sense, capability is like the structure that creates the opportunity to manifest your soul's desire. Finding and honing the right capabilities to support your own inspiration seems to be the name of the game. Hope these thoughts help you too along the way! Posted by Laura A Knauth at Thursday, May 16, 2013 No comments so far. Comments Welcome! 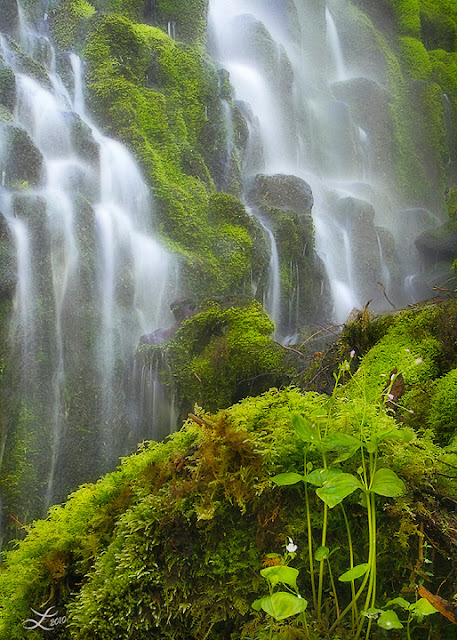 Proxy Falls is a huge waterfall with a thundering roar, but some of the cascades separate from the main deluge to create the opportunity for a more intimate scene. Fortunately on cloudy days or for waterfalls in the shade, there is time enough to spend hours trying different perspectives using various lenses (compared to the rush to catch what optimal compositions may reveal themselves at the quickly changing light of sunrise and sunset). For this shot, I tried a close-up down near the mossy rocks at the base of one of the quieter cascades to capture some foreground detail that might otherwise be overlooked viewing the spectacular waterfall at a distance. Here are some sweet flowers popping up over the bank. Posted by Laura A Knauth at Tuesday, May 14, 2013 No comments so far. Comments Welcome! I've taken a couple photography workshops in the past, and I have to say that I do not think they are a worthwhile investment. I actually wasn't even seeking them out, but signed up mainly because several of my photo friends also signed up - I suppose I wanted to be social and convinced myself it could be worthwhile. Most photo workshops are at least several hundred dollars, not including transportation or lodging (both of the workshops I went on were over the weekend, so it involved an overnight stay). That all adds up to what turned into a significant investment (for me anyway). I have absolutely nothing against the workshop instructors; they were good people, and I did come away with a few tips that I still use today. But how much $$ is an idea worth . . . and could you have found out elsewhere? It's not easy to decide; here are my thoughts. Interestingly, both of these tips were not formally part of the workshop, just random things I either overheard on the day or were randomly brought up through a question. I unfortunately also learned tips that I knew from prior research were not right, or led me astray and I've subsequently abandoned. It's a problem when the people leading the workshops are good enough to be impressive, but not yet knowledgeable enough themselves to help you avoid basically amateur pitfalls. I had even asked in one of the workshops about any tips to help organize gear while you are shooting at critical times of the day (since I always seem to be rushing to find a particular filter, or adapter, or lens, and end up missing opportunities); I was told that was something I should work out for myself . . . and I am taking this workshop, why? Workshops have the mystique that you will learn something incredible that could change your trajectory and transform your craft, but frankly, I've learned incredible things just by chatting with fellow photographers while out on location, reading photo books from the library, or watching YouTube videos and podcasts. At the end of the day, I would have preferred to invest the money I spent at workshops in a new camera lens or gear (heck, even just more batteries or memory cards which I feel guilty about buying but are incredibly useful in a pinch), or transportation & lodging on impromptu photo trips with friends. 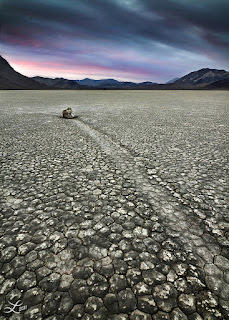 Some of my favorite photos I've taken far were from one such trip with friends to Death Valley National Park (ie: Fire & Ice, Heavenly Dunes, and Travel by Twilight, among others). So, in the end, I'd have to say workshops seem like a pyramid scheme to me. At this point, I'm skeptical of taking advice from photographers that make most of their money through other photographers (via workshops), and not from people who are actually buying photographs (which seems to me the ultimate goal). Again, nothing against workshop instructors; it's just that you can probably learn something similar for free by going on photoshoots with fellow photographer friends and mainly experimenting yourself. One of the benefits of workshops is the chance to meet a whole new set of photographers. Networking. Seems like producing good images is only the first step, but networking - or who you know - is a huge second component to becoming a successful photographer. (I suppose that's true for most anything, actually.) The issue is whether spending hard earned money on workshops is the most cost effective means to achieve this. 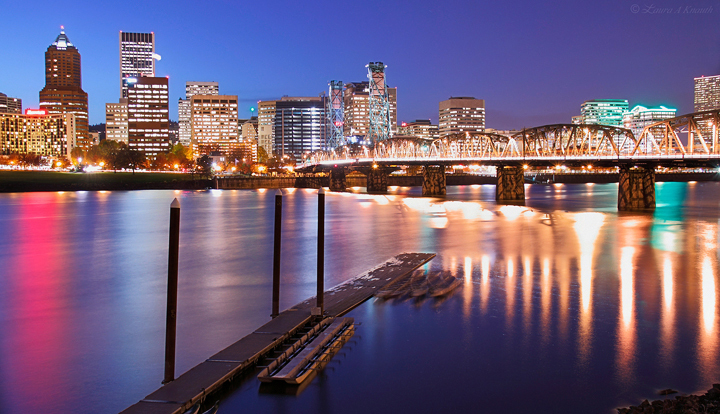 There are other ways to meet up with fellow photographers that are not fee-based, after all. It's an individual decision, and it's true that you never know where you will find some gem of an idea that will lead you to the fastest improvement. At this point though, I'm inclined to avoid workshops, and focus instead on individual practice (reading books and consistently experimenting with the various techniques) and more photoshoots with friends. Posted by Laura A Knauth at Monday, May 13, 2013 No comments so far. Comments Welcome! This is one of the four larger peaks of the Mesquite Flat Sand Dunes. 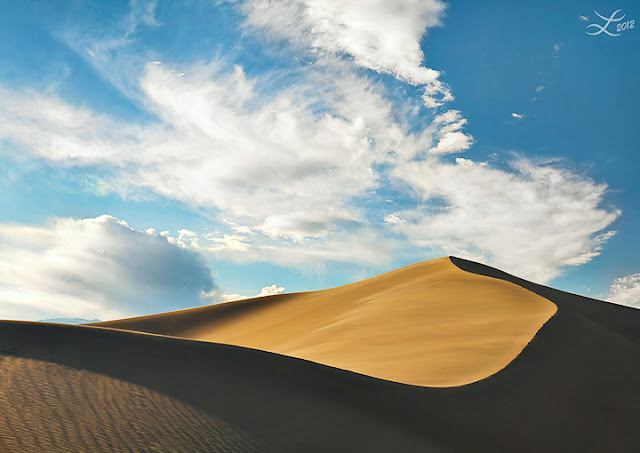 The larger dunes are tricky because they are a magnet for hikers and usually are covered with footprints. This dune was the one further away from the parking lot and had a nice ridge for catching sunset rays. I'm pretty sure I used just a Circular Polarizer for this one. Posted by Laura A Knauth at Sunday, May 12, 2013 No comments so far. Comments Welcome! This is my favorite Photoshop processing technique at the moment: boosting Midtone Contrast using the Unsharp Mask filter. Increasing Midtone contrast removes what looks like a hazy film over your image and I think makes images look much more vibrant. I haven't posted too much about my processing workflow yet since I’m still significantly tinkering with it. Regardless of what I'm trying though, I add this step somewhere along the way. I've been using this technique for several years, and have yet to find another method I like better. The good news is that Unsharp Mask should be compatible with most any version, even ancient versions, of Photoshop. Since the technique uses an Unsharp Mask filter, I first create a new merged layer (ctrl+alt+shift+e on a PC) to preserve the original background image. The settings for Unsharp Mask have nothing to do with sharpening. Instead, you will do something strange, very strange. The basic template is to essentially make the Radius much bigger than the Amount (and leave the Threshold very low; I like 0). Then vary the Amount to taste. I start with Amount: 5, but have been known to push it up past 40 depending on the image (for big moves above 10, I sometimes prefer to repeat the process on subsequent Filter layers for a smoother effect, but did it all in one for this example). This midtone contrast technique has helped me so much; I don't notice any weird haloes compared to other approaches. I had thought this Unsharp Mask technique was just a poor-man's version of the Clarity slider, but when I finally upgraded to Photoshop CS5, I was so dissapointed at the haloes introduced by the vaunted Clarity slider in Adobe Camera Raw. Turns out, I like the old Unsharp Mask approach for boosting midtone contrast much better! Caveat: The one big drawback for this approach in my workflow is that this technique uses a filter, not an adjustment layer. Even using 'Smart Objects' in later versions of Photoshop does not really help because it doesn't change the fact that any further tweaks you may make to adjustment layers below this image will no longer propagate to future adjustment layers. For this reason, I try to use this technique at the very start of my flow and then build any adjustment layers on top of it. I might also apply this filter again at the very end to recover clarity lost when reducing the image size for the web. I also like improve midtone contrast with High Pass filter described below, but it unfortunately has similar potential halo issues like the clarity slider. Unfortunately, this can also introduce some haloes. I usually spend time trying to clean them up in subsequent layers. Most of my other processing techniques are in a huge state of flux right now. I've been spending an embarrassing amount of hours tinkering and experimenting. I even just bought a book about the strange and mysterious world of LAB mode - yikes, wish me luck! (And by all means, post any photo processing tips you are willing to pass along, related to midtone contrast or otherwise.) So far, through it all, this Unsharp Mask method of enhancing midtone contrast has been a quick and reliable mainstay for just about every image I process. Hope this technique helps you too! Posted by Laura A Knauth at Saturday, May 11, 2013 No comments so far. Comments Welcome! You never know what the weather will bring. 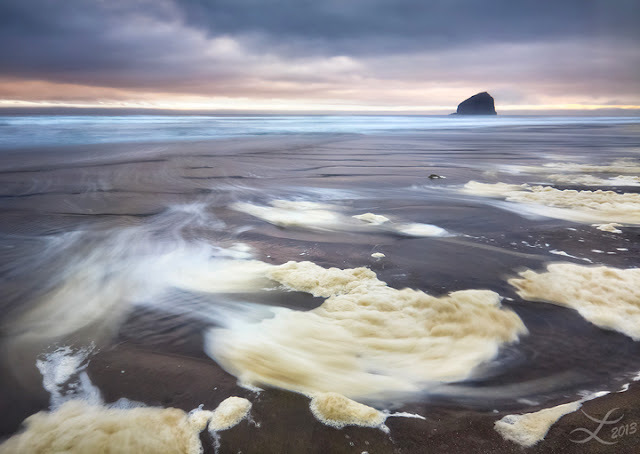 After a nightlong downpour, and drizzly pre-dawn, the skies began to clear at daybreak to herald a beautiful day for photography, starting with this series of photos from Cape Kiwanda. I played around with different lenses and perspectives, and two different takes on the same location are shown below. For the one photo I've sold to a magazine cover (Curve of the Earth), I was very fortunate the magazine was willing to post-process the image to add more sky, extending the horizontal shot vertically, not only to fit the aspect ratio they needed, but also to add more negative space for their magazine content (Title, Article lists, ...). It was a great lesson since I hadn't thought to play around with negative space more often, and many people have a tendency to only shoot landscape shots horizontally. The tide carried foam patches along the beach in these interesting abstract swirls. Posted by Laura A Knauth at Wednesday, May 08, 2013 No comments so far. Comments Welcome! Save money and pick free food already growing in your own backyard. :) Turns out dandelions are probably one of the healthier foods you can be eating, and it's probably growing somewhere close-by wherever you are in the world. 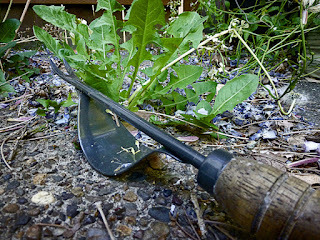 When I was a kid, I remember the frustrating chore of trying to pull up dandelions, and their tenacious roots, as they sprang up all through the mowed lawn. I had even come to associate those lovely yellow flowers as a nuisance - sigh. Strange to realize people (including me) were conditioned to spend money on chemicals to kill the dandelions, more chemicals to cultivate expensive finicky garden plants, and then spend more money buying food from the store. … Always follow the money. I've learned a more cost effective, less time intensive, more rewarding approach to gardening: Appreciate the wild food that flourishes on it's own and likely provides more nutrients than what you would pay for in the store. :) For some reason, when I was growing up, I had thought dandelions were toxic … the white sap from the flower stalks always scared me, but just about every part of the dandelion, from the roots, to the flowers, the stalks (including that sap), the leaves, the seeds all are attributed with different nutritional or medicinal benefits - not only for vitamins & minerals, but lymph system and digestion support. I bought mine on Amazon but it might be at your local hardware store. So far, I've just put the leaves in my smoothies, and made tea with the roots, but that's only the top of a very long list of possibilities. Here's a YouTube video that I found helpful when I was initially learning about the benefits of dandelions. Among other factors, the deep roots of the dandelions make them more likely to pull up minerals from lower layers of soil vs other plants whose roots stay in depleted topsoil. Dandelion mimics (like Cat's Ear) are also edible, but for salads, the smooth surface of the true dandelion leaves might make them more appealing. Already I love this bottom-up approach (to support what is already working) rather than a top down, frankly arrogant, authoritative, micromanaging approach that is usually encouraged in so many facets of modern life. It's not like we have more resources than we know what to do with nowadays; makes sense to me to focus on efficiency all around. The complete picture. Companies have no incentive to support wild foods. That's on us to investigate. Seems well worth testing to me! I'll post an update later in the year about how much time I spend working on the garden vs output compared to previous years. If nothing else, now when I look out at an open field and see the dots of yellow dandelion flowers, I can't help but smile and appreciate the bountiful resources growing freely. (Although I'd be cautious about eating them from public parks or along a roadside though since spraying is so common, and pets are usually marking their territory…) Now that I'm learning more about wild foods, it's fun to walk through the park and realize there are also other edible plants growing all around: berry bushes, miner's lettuce, clover, horsetail (for tea), and on and on. Random side note: I was watching part of a zombie movie where survivors were walking through a forest stressing about where to find food … but they were surrounded by wild food, they just didn't know so much of what they were walking by was actually edible. It's like if it's not in a box or a can, it is not 'safe' to eat. Doh! 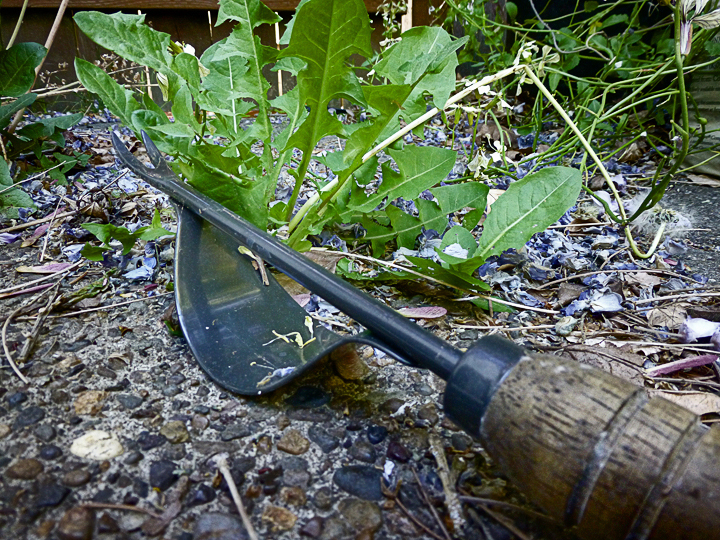 So, here's a post in defense of dandelions and other maligned weeds. I would recommend doing some research to make sure you have properly identified the plants, or maybe deliberately try planting seeds of known plants (I ordered several varieties from Seeds Of Change and Mountain Rose Herbs. Maybe it's silly, but I wanted to play it safe.) In general though, as long as the dandelions haven't been sprayed or otherwise debacled on ;p with minimal effort, you might be able to take advantage of free food already growing in your own backyard! Posted by Laura A Knauth at Monday, May 06, 2013 No comments so far. Comments Welcome! Dream Big Live Real is a blog of practical tips for creative minds. (And I say everyone has a creative mind :) Posts range from health topics, to photography, writing, and any musings I hope will be helpful. Life is all about options and uncovering unexpected possibilities! I intend to provide key words for further investigation about topics that I have found were of great benefit to me. The product-related links I list on this blog are resources I wish I knew about earlier; I have no affiliation with the sites. I use Flickr and 500px to upload my latest photos. My goal is to capture unique views of the inspiring places I've been, in the hopes of encouraging you to explore the world, or take a closer look at the possibilities right in your own backyard! Profile pic by Parag Shah.